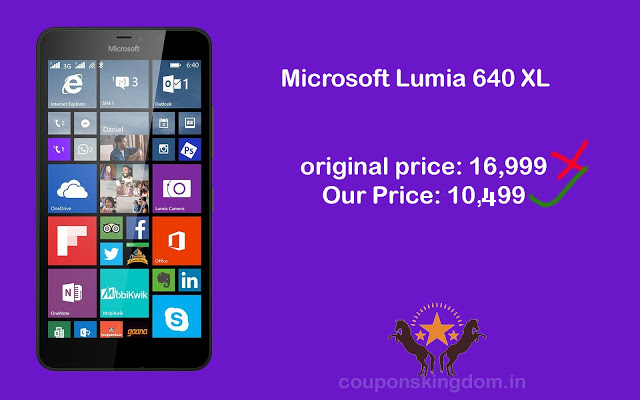 Microsoft Lumia 640 XL windows mobile is one of the latest release from Microsoft. It is rated as one of the best mobiles released by Microsoft, it comes in 3 colour variants black, cyan, orange. At Amazon India buy this windows mobiles with EMI starts at Rs.937.74 per month. Cash on delivery is available with this mobile. Microsoft Lumia 640 XL comes with 5.7 inch LCD multi capacitive touchscreen with a resolution of 1280x720. Display has 16m colours support. Playing games is great fun with this mobile, also movie watching experience is so great that you can't stop watching it. Microsoft Lumia 640 XL has 13 megapixel primary camera and 5 megapixel front camera. The camera has many more features such as auto focusing, daylight setting, Auto Expo adjusting. Microsoft Lumia 640 XL comes with Windows 8.1 operating system, it is powered by 1.2 gigahertz Qualcomm Snapdragon 400 Quad Core processor. Microsoft Lumia comes with 1GB RAM, 8GB internal memory, in expandable upto 128 GB. It has dual sim slot 1 slot for GSM + 1 slot for WCDMA. Microsoft Lumia 640 XL is powered by 3000mAH Lithium ion battery which provide a talk time of 31 hours on 2G, 23 hours on 3G. It provides a standby time of 936 hours. Microsoft Lumia 640 XL has 1 year manufacturer warranty for device and 6 months manufacturer warranty for in box accessories from the date of purchase. Battery life is excellent even it works on Wifi for more than 24 hours, the camera quality is so nice and can capture images in low light as well, the mobile is so useful for multitasking. Overall the mobile is rated at 4.5 out of 5 stars.